A game favorite for generations. 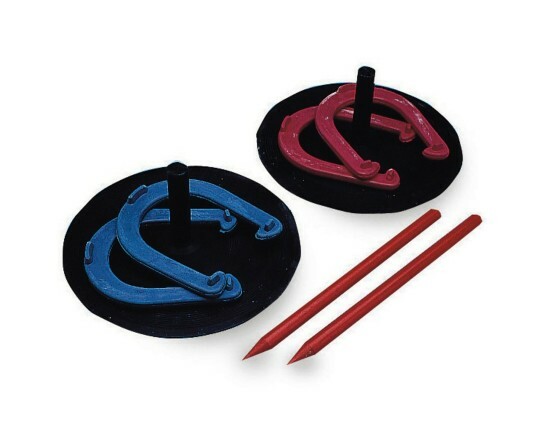 No-worry plastic horseshoes for safer play! Lighter than metal horseshoes yet very durable. Everything you need - Just set up and play! Set includes 4 each 9-oz. plastic horseshoes, 2 each 16" plastic stakes and 2 each 12" rubber mats with rubber dowels and rules. Suitable for indoor and outdoor play. I've used them in the past with good response. It is an adaptive version but it allows elderly to re engage in a familiar activity. The memory care residents I work with played this during our indoor Western themed party. It was a huge hit! Easy to set up and easy to use. The horseshoes are the perfect weight not too heavy and not too light. This set is perfect for indoor use. Used this for field day and the students loved it as many had never played horseshoes before. Great game for an excellent price!